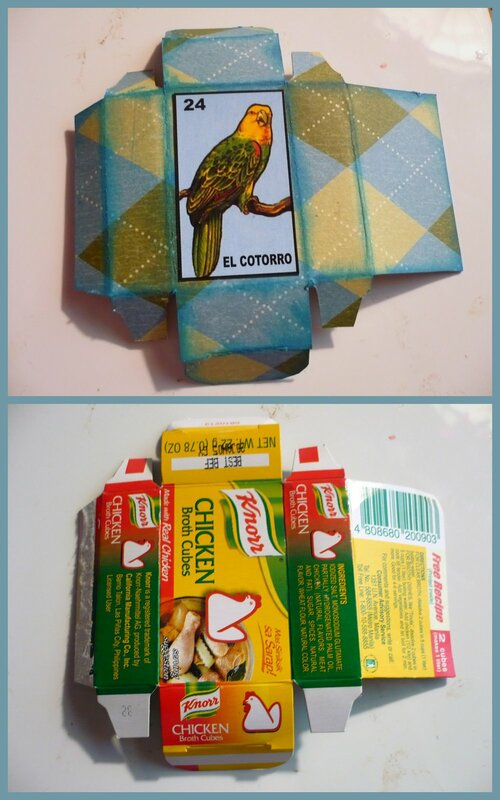 Here's a little no-brainer gift box made from a little teeny chicken broth cube box... Simple enough, I just flattened out the box, then used a gluestick to attach paper. Once it was dry, I used an exacto to cut out the box shape again. Then I used an ink pad to add blue to the edges and slapped on a loteria card! Sorry I haven't been blogging lately... to be fair, I have really been only making wicked witch bookmarks to sell so I don't have any awesome new crafts to share. I've been feeling pretty ill lately. Bobby took me to the hospital on Monday because I had been fainting all weekend. I had fainted a few times over the summer, but we didn't really think anything about it, but Saturday, Sunday and Monday morning, I just kept going out of it. Anyway, they did blood tests, EKG, a CT scan, chest x-rays, etc. They ruled out any of the real dangerous things, I don't have a brain tumor or diabetes, or anything deadly. So we still don't know why I've been fainting and weak. They stuck a heart monitor on me for yesterday and we brought it back in this morning so they can analyze the heart rate recordings. It's kind of scary... But I feel a bit better today. I hope we can figure this out. I want to get back to feeling super, so I can get super-crafty up in here again! I hope everybody is having a good week so far. And finally, the last Tiny Book!!! This one is shaped like a butterfly and has a birds theme. I've gotten a request for product specs, so I'll try to specify the stuff I used, though most of it was from the stash. I used the butterfly shape in the "Serenade" Cricut Cartridge and cut the shapes out of cereal box! Next, I painted each spread with cheapo craft acrylic paints to look like various butterflies. Then I sanded them down on the edges with a my Harbor Freight rotary tool (ten bucks!) and smudged the edges with colorbox pigment ink to make them look kinda dirty. The bird images and phrases are cut out of an illustrated animal encyclopedia set that I bought at the thrift store. I added lots of ribbon pieces and rhine stones and feathers and tags and whatnot to stick out the edges! The binding is just three large jewelry jumprings put through little punched holes. This is the front and back cover, simply because this was my favorite spread :) So I hope that info was useful! Happy Monday! Have a wonderful week! Mustache papercrafting! My other little books have arrived at their destinations, so now I can share them. I made this tiny book for Sheepblue (Quirkiecraft!) 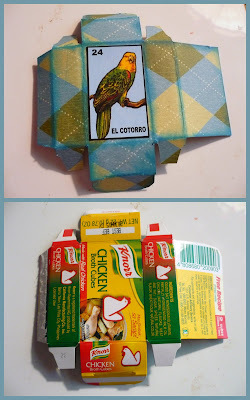 in the One Tiny Book Swap over at craftster! She likes the silly/awesome theme of mustaches, and I had a lot of fun making this little book. I was psyched to find the perfect book at the thrift store with great mustachio'd imagery to cut out and use! Each page has a different mustach-man and an adjective to describe his facial hair. This spread is my favorite one out of this book! A pirate mustache! See the beads on the left side?! I really like this spread, too. Yellow ochre is one of my favorite colors, I think. And here are the front and back covers. Now there's one more tiny book to show you this week! Stay tuned! Happy Wednesday! I was all about different shapes for my tiny books... I took a good look at my cricut cartridges to see what kinds of shapes I could make into some books. This birdhouse shape seemed like a good one. The birdhouse was symmetrical, with ledges on both sides, but I had to cut off the inside ledges so the little tabs didn't interfere with the binding. The book is about 3 inches tall. The pages are made from cereal box either painted with acrylic craft paint or covered with paper. I love using cereal box, because I always have some around, and it's sturdy without being too thick. I added a lot of rhinestones and gems because I was digging the sparkle factor! I think this could be my favorite spread out of the whole book. Colorful accents on black is a scheme that I should use more often, methinks. I drilled little holes at the bottom edge of this page and then used a needle and thread to add beads as an accent. It turned out pretty cool looking. It would have been cool to go all the way around the edge with the beads.... Maybe I'll do it in another book. You can see the beads a little better in this picture, and on the left edge, some Peanut feathers!!! Have I really not posted since August 31?! I guess my concept of time has really been messed up lately! Bobby and I drove up to Ohio for Labor Day weekend, I came home with a wicked cold, and have been lazing around for an entire week. This weekend was much more productive... I'm working on some.... STUFF. Big announcement coming soon :) Happy Monday!